The arrival of summer brings rapid growth for our vegetables, but with warmer days and settled weather comes the inevitable pressure to keep plants hydrated and happy. If you're not careful, hot, sunny weather can make you a slave to the watering can - so it's time to get water wise in the garden! Many gardeners water more often than necessary, which encourages plants to produce shallow roots that make them ever more dependent on you for water. Encourage deeper roots by watering less often, so that roots draw on the moisture found further down in the soil. A thorough soaking once a week is better than a sprinkling every two days. In dry weather prioritize seedlings over established plants, as they require more water until they have developed their root systems. Some crops, such as leafy salads and celery, need more water than others, while others appreciate extra water at crucial stages in their development, for example peas, tomatoes, squashes and cucumbers as they come into flower and produce their pods or fruits. Tall plants such as climbing beans will draw a lot of moisture from the soil, so will need a lot more watering than other crops. Some plants are surprisingly drought tolerant. Parsnips, for example, have long taproots that enable them to reach far down for moisture. How you water is important. Apply water as close to the roots as you can, and try to avoid wetting the foliage, which is wasteful and can promote disease. A watering can will help you to get in among the foliage, and while you're doing so you can inspect your plants. Never water in the middle the day when most of the moisture applied will quickly evaporate. Sometimes the soil surface looks dry when, just beneath, there's plenty of moisture. Check by digging a hole to see how dry the ground really is. If it's moist where the roots are, leave watering to another day. Drip irrigation is the most efficient form of irrigation system as it delivers water close to the roots. Add a timer to deliver the water early in the morning or in the evening, when evaporation rates are lower and little will go to waste. You can add irrigation setups in the Garden Planner by selecting the irrigation layer from the toolbar. To select an item - for example a length of dripline - click once to pick it up, move your cursor to where you want to place it, then click and drag to position it. You can create curves in irrigation tubes by clicking on and dragging the middle ‘handle'. Plant strategically and save water. For example, create miniature reservoirs for thirsty plants such as zucchinis by banking up a miniature levee around each plant. This holds the water you add in place, allowing it to slowly drain into the soil, rather than running off. You can also sink plant pots into the soil then water into these, or cut the bottom off a plastic drinks bottle, prick holes into the cap, then bury it upside down into the soil for slow-release delivery of water to the roots. If the weather is dry at sowing time, water along the seed drills before sowing. Allow the water to drain away then water again. Then sow and cover over with soil. There's no need to add more water after covering the seeds over. They will have a perfectly moist, cool environment in which to germinate. In hotter climates you may also need to rig up some shading until seedlings are well established. When planting out seedlings or young plants, correct watering is crucial. Water into the planting hole before planting, set the seedling into the ground, then water again to settle the soil around the rootball. The additional moisture around the rootball will get the plant off to a really strong start. If you're growing in containers, remember that larger containers dry out much more slowly than smaller ones. If you aren't on hand to water as regularly as you'd like, mix some water-retaining granules into the compost before planting. Grouping pots together will help to raise humidity, slowing evaporation. Rainwater is better for plants than treated water. Collect as much of it as you can by installing water barrels to downpipes. You can link up multiple barrels using connectors. 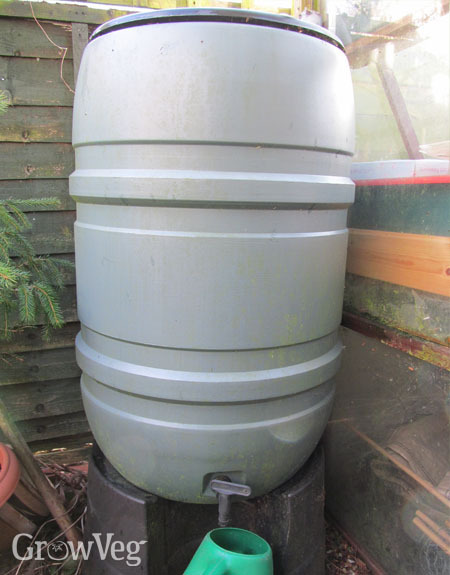 Water barrels can also be added to your garden plan. Simply click to select, move to where you want it on the plan, then click and drag to place it. Use the corner ‘handles' to adjust the area of the barrel to accurately reflect the size of your model. Known as mulching, adding a layer of organic matter onto the soil surface can dramatically slow evaporation from the ground. Suitable mulches include dried grass clippings and garden-made compost, topped up as necessary during the course of the growing season. The best results come from repeatedly applying organic matter such as compost over a number of years. All that organic matter works to gradually improve your soil's structure and its ability to hold moisture, ultimately ensuring the health and vigor of your plants. Feeding your soil with lots of organic matter makes such a big difference to its moisture-holding ability, while watering exactly where it's needed, when it's needed, will save a lot of time - and water! We'd love to hear how you keep water-wise in the garden - please share your tips below. "hallo i am looking for water retaining granules.i stay in hartbeespoortdam a very dry and hot climate.where can i get it and what is its name"
"You might find water retaining granules listed as water retaining gel. A simple search with this term on Amazon throws up lots of options." "Better than these granules is to add lots of compost and to mulch deeply. I thought these granules were the answer to keeping the soil in the pots I grow my miniature roses in from drying out so quickly. But they started dying even worse. I finally found out that, because the granules attract water so well, they were actually PULLING WATER OUT OF THE ROOTS. This killed the roots and eventually the plants. I solved my water problem by adding a lot of coir peat to the commercial potting mix I use. In the ground, the equivalent is digging in a lot of compost, as much as 1:1, before planting, then keeping at least 3" of compost mulch on top of the soil. Worms will help to incorporate this down into the soil to keep the organic material level high. Do be sure that any mulch you use stays at least 1" away from the plant stem." "Hi Lynne, that's really useful, thanks very much for sharing your experiences. Yes - lots of organic matter is always a good thing!" "I found that when planting by seed, i add a layer of cow manure to my base before I sow my seed my seeds. I find that my seeds sprout quicker." "Thanks for the tip Rob. Clearly those extra nutrients are giving the seeds a real boost!"